We start by placing warm mineral basalt or cold marble stone at specific points of the body to warm up the tissue. Then scrub the body with Himalayan salt soap to exfoliate the skin. 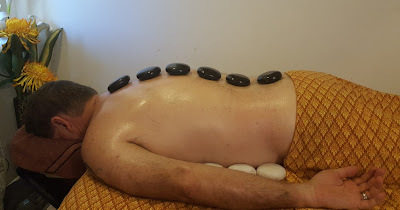 This is fallow by a relaxing warm basalt or cold marble stone massage without using strong pressure to the muscle or you can choose Cold&Hot stones massage(Yin-Yang) to induce healing energies of the earth into your body, spirit and mine. Selenite palms Yin-Yang harmonizers are also used to clean auric field from negativity and serve as self-empowering tools for health. We finish with a nice mini crystal face massage and Chakra to enhance energy to your body. The application of hot stones to an area penetrates the tissue deeper, soften the muscles and releases tension. Furthermore, with the application of cold stones acute injuries can be treated better, by reducing muscle inflammation. Hot stone bring oxygenated blood to an area, increasing lymph flow and metabolism. Conversely, cold stones push away unwanted congestion and blockage of any kind. The result is vascular gymnastics that helps detoxify the body and bring it back into balance. Alternating the use of both hot and cold stones to Yin-Yang side of the body increases the circulatory response from all systems and helps to restore harmony of Yin and Yang. Mineral basalt stones are used for hot stones massage because it has magnetic iron that holds heat and the stones are present during volcanic eruptions. Basalt stones massage is believed to be therapeutic and have marvelous healing energy. It is said that one stroke with a heated stone is equivalent to ten normal massage strokes! It contains a certain proportion of oxygen and silica as combined element and it has high iron and magnesium that are essential to healing and medication that brings a mental and spiritual wellness. The crystal bath salt bar, with its inherent 84 minerals and trace elements, provide therapeutic benefit for number of ailments such as, eczema, psoriasis, rheumatoid arthritis, sinus conditions, herpes, acne, neurodermatitis, athlete’s foot, warts, insect bites, bronchitis and osteoporosis. The general benefit of it is to stimulates the body, exfoliate and remove toxins from skin, strengthen and firm skin tissue and thorough cleaning of skin pores. The purpose of their usage is to strengthen the potential of the body’s energy and to harmonically distribute it among all organs. They also provide a strong and direct experience of life force and serve as self-empowering tools for health, personal growth and inner exploration. It helps balance spiritual and materialistic aspect of your personality and focuses your attentions on “NOW” It also helps with appreciation of every moment in your life and understanding time as past, present and future reality. It is the key to unlocks the doors to the higher vibration, fast and effective at cleansing auric field from negativity, relieve stress and fatigue also energizing of the whole person. The intensity of energy delivered by Selenite is greater than almost any other stone for the upper chakras. Like the aura, the chakras can be said to be a “ record” of our experiences. Every chakra when balanced reflects a particular pattern of energy that can be sensed as a different colour or perceived as a sense perception. The chakras stimulate the endocrine glands which in turn secrete hormones for cell growth and maintenance as well as other bodily functions. If an endocrine gland does not receive sufficient life force energy, the system does not function properly and the result is pain or disease. Actually, pain and disease can be seen as a message that in some way, thoughts are blocking the flow of life force energy. When an imbalance is present in a particular chakra, the key to restoring harmony in the system lies in developing the characteristic qualities that the chakra represents. The degree to which the chakras are activated, balanced and able to receive life force energy depends upon our will, our belief system and our emotional state.